First Premier Bank now offers a Second Card for your extended credit card usage which you can get at www.mysecondcard.com. This is a guarantee for you if you have excellent history with the bank. You will receive a letter enabling you to apply for the new offer if you apply within the expiration date given. You will receive a confirmation number which is highlighted in yellow as you view the mail sent from First Premier Bank. Get the confirmation number and enter it on the required text box and click the button that says “Apply now”. You can only use your My Second Card if you do not have any second accounts yet, or no pending applications from First Premier Bank. You will also not be eligible to apply for the second card if you have opened an account within the last 13 months. 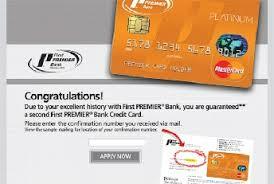 When you access mysecondcard.com you see a lot of options and offers to explore from First Premier. They have been known as one of the leading capitalized banks in America, and they have also been enlisted as one of the top issuers of Visa and MasterCard credit cards across the nation. For questions or specific concerns regarding your MySecondCard account applications, you may call their customer service by calling the telephone number 605-357-3002 or 800-501-6535. You can also reach the Sioux Falls office phone numbers 605-357-3001 or 800-743-2967.